Happy Friday! We have some adorable new photos of Christina El Moussa and her British beau, Ant Anstead, from their vacation in Cabo San Lucas, Mexico. El Moussa and Anstead’s relationship hit the six-month mark in April, and it looks like there will be plenty more months to come if the lovey-dovey vibes from these vacation photos are anything to go by. The pair look so comfortable and happy together, and what’s better than that? 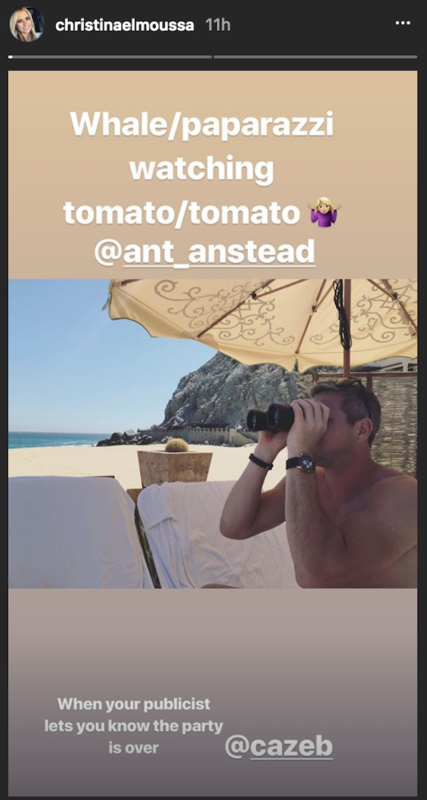 Judging by El Moussa’s Instagram, she and Anstead have only been in Cabo for a few days, but they’re already having so much fun together. In fact, El Moussa commemorated the trip on Instagram on Thursday when she posted a photo of the couple in a sweet embrace on the beach. The fun wasn’t limited to getting all cute and cuddly on the beach. In fact, El Moussa posted a shot in her Instagram story of the couple whale-watching (or is it paparazzi-watching, as she quipped in the caption?) — a solid vacation activity, if you ask us, especially when you’re a celebrity couple everyone wants to know more about. The jury’s still out on whether they spotted a paparazzo whale, but we’re sure they’ll let us know if they do. It’s not every day we get a video of Anstead and El Moussa just hanging out and enjoying one another’s company. These two are always chill about letting us see photos from their travels together, but watching their banter in the video Anstead posted serves as evidence that they’re really enjoying one another’s company. It’s just too cute, honestly.